Much has been written about Philippa Blair’s work and the multiple sources that inform it both technically and conceptually. Consensus has assigned influences from Kandinsky to de Kooning, and, more recently, Terry Winters and Albert Oehlen. Unself-conscious, spontaneous, and organic, Blair’s painting is recognized for achieving a delicate balance between gesture and structure, intuition and preconception. 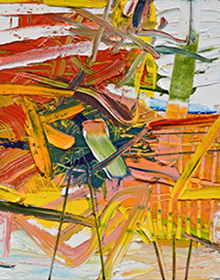 Vivid, color-saturated brushstrokes and squeegee traces swerve and dodge, collide and coalesce, to re-create both the recalled landscape and the frame of mind she was in originally. Memory, as a storehouse of indelible images, becomes her creative domain. Philippa Blair’s work has been widely exhibited in Australia, New Zealand, New York and Los Angeles. She currently lives and works in the port city of San Pedro, California. Organized by Ron Linden. Gallery hours are Monday through Saturday, 11 AM – 6 PM. This exhibition sponsored in part by the San Pedro Arts, Culture and Entertainment District and the San Pedro Chamber of Commerce. Visit the Transvagrant@Warschaw Gallery website for more information.